Everyone can regain a natural smile: whether after losing one or more teeth due to tooth decay, injury, accident or periodontal disease (periodontosis). Regardless of the reason why we can not smile freely, it is worth asking a specialist for the help. The best solution in such situations are dentures. Prosthetics dentures are used for partial or full deficiencies in dentition. They can be removed and put back into the mouth (which is why we call them a “moveable” solution) Such traditional dentures improve the appearance of the face and restore the natural functions of eating and speaking. An alternative to the removable dentures is a denture based on 6 implants. Such a denture is cemented to implants. Such a solution is comfortable and it stays securely in place, looks natural and requires less attention in everyday use and care. Patient receives a ready dentures and instructions for use from the doctor. fitting of a ready dentures, possible corrections. 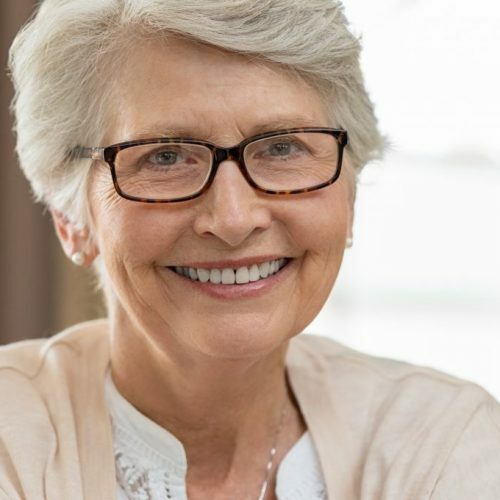 When traditional dentures has problems with fitting (most Patients describe it as a “loose” dentures, which tends to shift or fall out, which results from gum deformation), a more beneficial solution may be to restore the teeth with a dentures based on implants. Dentures based on implants requires the implantation of 2-4 implants. On them, using a locator, a denture is fixed. Dentures on implants are a good solution for Patients who have not previously been satisfied with the use of removable dentures. Dentures based on implants provide a better fit and higher stability than a conventional solution. Implants have the role of anchoring for precise retention elements fixed in the dentures. There are various types of retaining elements with the benefit of maintaining the dentures. Dentures on implants are pulled out for daily hygiene treatments. An alternative to the removable dentures is a denture based on 6 implants. Such a denture is cemented to implants. Such a solution is comfortable and it stays securely in place, looks natural and requires less attention in everyday use and care.